感谢 MAD 对gooood的分享 。更多关于他们：MAD on gooood. 30 March 2006: The day after MAD was introduced as a finalist in the international design competition, the Toronto Star ran a cartoon beside a large editorial about the competition. 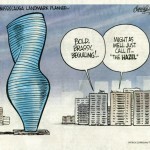 While the cartoonist mocked the ambition of Mississauga’s Mayor, he perfectly portrays the quality of our design: a recognisable building that captures people’s imagination in an environment of generic boxes. We call our cities steel concrete forests. Throughout the process of urbanization, skyscrapers have been symbols of technological bravado, prime capitals and the societal projections of wealth and prosperity. This limited framework for skyscrapers often results in solutions limited by homogenous, linear structures and degenerative duplication in business districts across the globe. Forced into an unnatural state of conformity, metropolitan life is negatively affected by these unchecked, efficiency-centric development practices. Without a challenge to the status quo, our cities will continue to lack the cohesion of life as implied by the term: forest. A forest is a thriving ecosystem wherein every organism survives only in a state of symbiosis. 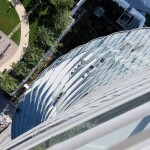 New ambitions nurtured in a changing global consciousness challenge the aging pattern of last century’s development and favor fresh thoughtful, inspiring and eloquent solutions for tomorrow’s high-rises. What lies in the future of our cities? 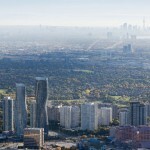 How should one grasp the concept of emerging high-density cities? How can city dwellers be immersed with an enriching experience of nature when its presence steadily diminishes in the face of the ever intensifying concrete inundation? Faced with these challenges, future high-rise buildings need to catalyze a higher level of complexity in our cities for the sake of harmonious civilization. 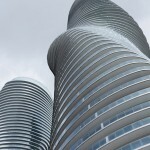 Fondly dubbed the Marylyn Monroe towers by local residents, the Absolute Towers parallel the twisting fluidity or natural lines found in life. This activation of flow forms an organic punctuation in the landscape and a desire for an urban acknowledgement of enthusiasm. Here, we thrive to challenge the sustenance of commonplace boxy skyscrapers. 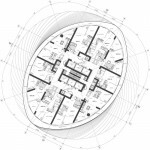 Our ambition was to provide each resident a unique experience of the city, a heterarchitical distribution. Continuous balconies widen individual viewing angles and promote community at the micro scale of a single floor. At the macro, the cadence of the floors rising into the sky echo the modular rhythms of the human experience, yet emphasizes the movement of an adoring figure. We hope this building can wake up metropolitans’ desires towards nature, such as sun and wind, and certainly, human bodies. 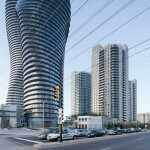 Like other suburbs in North America, Mississauga, near Toronto, has been quickly developing into an independent, urbanized area. Yet, the cityscape lacked a unique character. In response, we wanted to add something naturalistic, delicate and human in contrast to the backdrop of listless, boxy buildings. Sited at the junction of two main streets (Hurantario and Burnhamthorpe), the Absolute Towers gracefully bear their landmark status and act as a gateway to the city beyond. As a residential landmark that strives for more than simple efficiency, the buildings provide residents an emotional connection to their hometown and neighbors. Eschewing the tradition of accentuated verticality in high-rises, the Absolute Towers choose not to emphasize vertical lines. 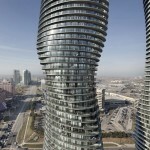 Instead, the design features a smooth, unbroken balcony that wraps each floor of the building. 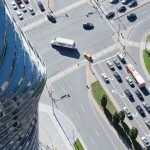 In addition, at each successive level, the floor plate rotates in a range of one to eight degrees affording breathtaking panoramas of the Mississauga skyline concluding in reverence to the principle street intersection at its peak. 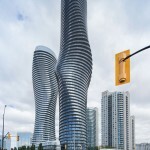 By maximizing the viewing potentials inside and out, creating a wonderful medium for social interaction throughout the balconies, and connecting the city dwellers with naturalistic design principles, Mississauga is infused with a new character. In place of the basic, functional logic of an aging modernism, the current trend of sustainable design is reminiscent of the sudden rise in the glass-faced boxy buildings of last century. Sustainability, in concept, is often unfortunately simplified to the lowest common denominator. If we limit the scope of sustainable ecology to energy savings, it will become merely a demand for comfort while the yearning of a return to nature is ignored. This design practice remains the axiom of the industrial revolution, man controls nature. We feel sustainability is a much greater concept which can guide a new culture of design resulting in real change. For instance, in traditional Chinese gardens, building and nature elements are integrated to create a spiritual and poetic environment fostering great literature, poem and music, or simply life and philosophy. Our approach, ergo, is to create a balanced environment that evokes the feeling of exploring nature while simultaneously a responsive model for the development of urban space in harmony with nature. A sustainable architecture in modern concept. Real sustainability results in a harmonious civilization.This is the biggest challenge of our time. How do we rebuild urban environments with life and emotion where people are connected and respected? The torsional form of the towers is underpinned with a surprisingly simply and inexpensive structural solution. The two residential towers are supported by a grid of concrete load bearing walls. The bearing walls extend and contract in response to the sectional fluctuation created by the rotation of the floors while the balconies consist of cantilevered concrete slabs. In order to ensure the elegant edge profiles are as thin as possible, there is a thermal break in the slabs at the exterior glazing such that the insulation need not wrap the entirety of the balconies. 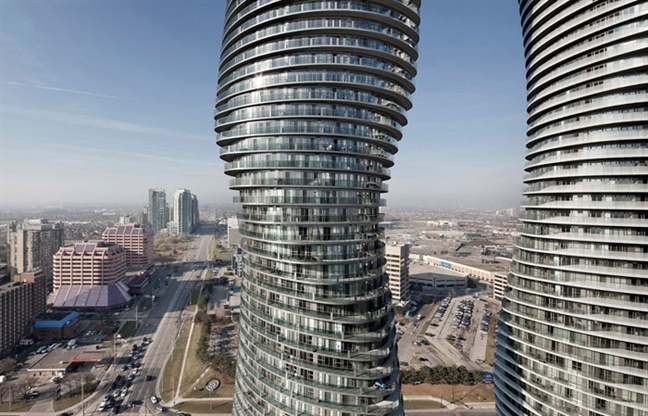 Meanwhile, the dynamically fluid shaping of the towers, naturally aerodynamic, adeptly handles wind loading and ensures comfort throughout all the balconies. 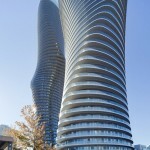 Besides providing every resident with a nice exterior place to enjoy views of Mississauga, the balconies naturally shade the interior from the summer sun while soaking in the winter sun, reducing air conditioning costs. Associate Architects: BURKA Architects INC. Structural Engineer: SIGMUND, SOUDACK & ASSOCIATES INC.
MORE: MAD video link (Youtube)，更多关于他们：MAD on gooood.